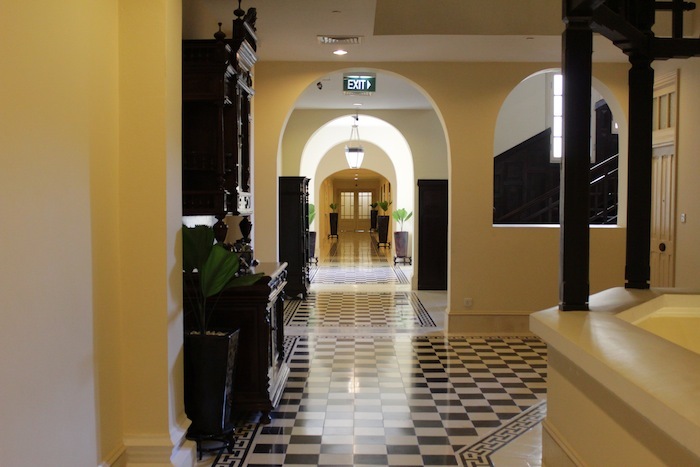 The Raffles Hotel Le Royal, oozing colonial charm. 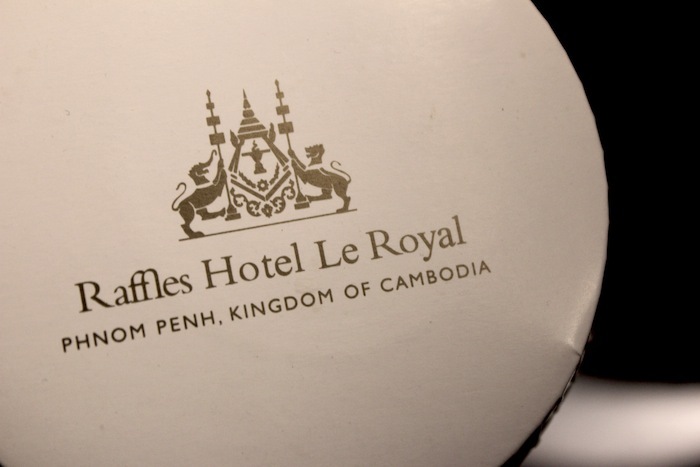 While in Phnom Penh, stay at the Hotel Le Royal, so goes conventional wisdom. And so I did. 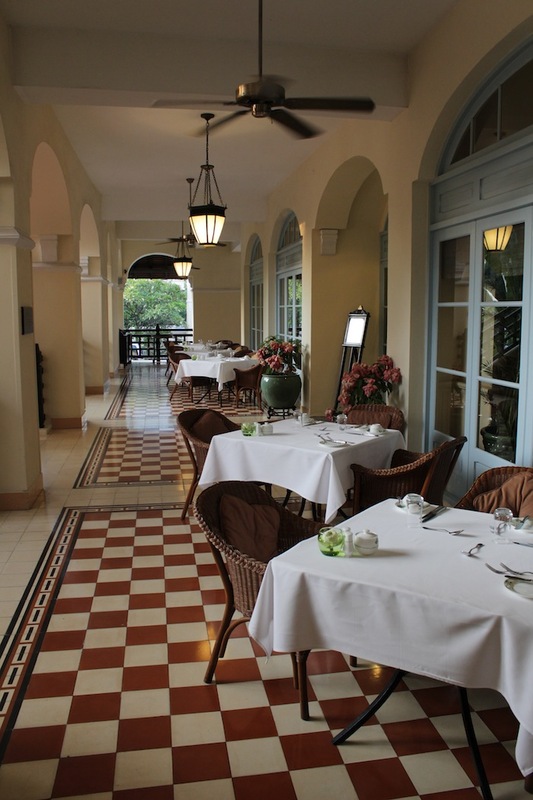 Situated in the heart of the city’s colonial quarter to the north, Le Royal has led a charmed life. 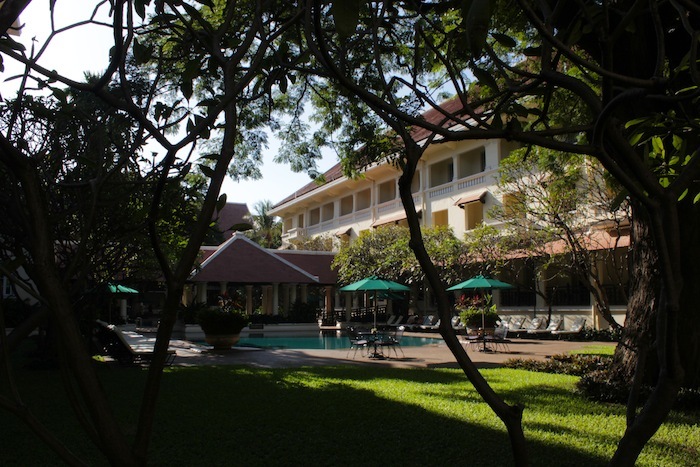 Opened in 1929 by the French colonial authorities, alongside sister hotels in Siem Reap and Hué, it very quickly established itself on the Grand Tour circuit – Phnom Penh being a convenient stopover en route to the ruins of Angkor – as the establishment of repute in all Cambodia. Designed by Ernest Hébrard, also the city’s urban planner, it reflects an original (at the time) and self-consciously French Colonial architectural style that embellished European facades with trimmings like sloping tile roofs, shuttered windows and large, airy corridors adapted for the tropical climate. 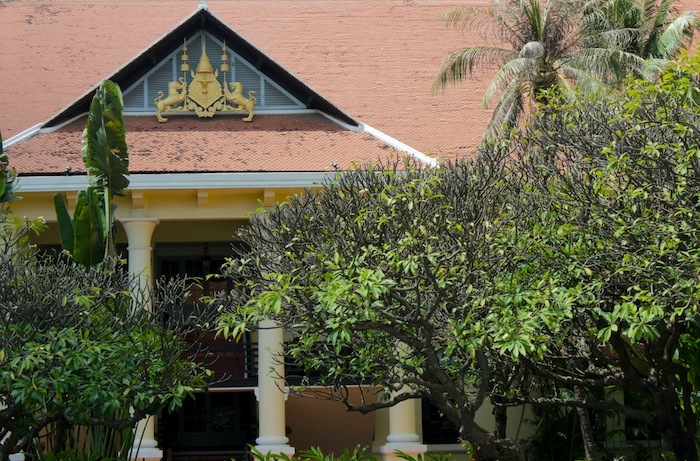 The hotel’s link to royalty was firm from its very inception: King Sisowath Monivong himself graced the hotel’s opening reception, while Sihanouk was a frequent visitor. Hollywood and literary royalty too patronised the hotel when they passed through the city: the likes of Charlie Chaplin, who stopped by for a single night in 1936, for example; and the usual suspects in the literary (particularly the Francophone literary) world – Somerset Maugham, Pierre Loti, André Malraux and so on. The airy, quiet and characterful corridors on the second floor. My room was at the end of this corridor, to the left, facing the front of the building. That the hotel remains standing today is rather a miracle, given the tumultuous recent history of Phnom Penh. 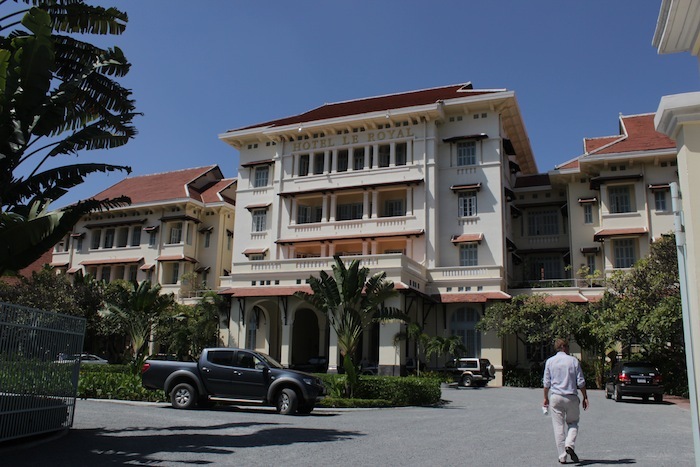 During the Japanese Occupation, the place was used as a military barracks, as were most other Grand Hotels in the region. 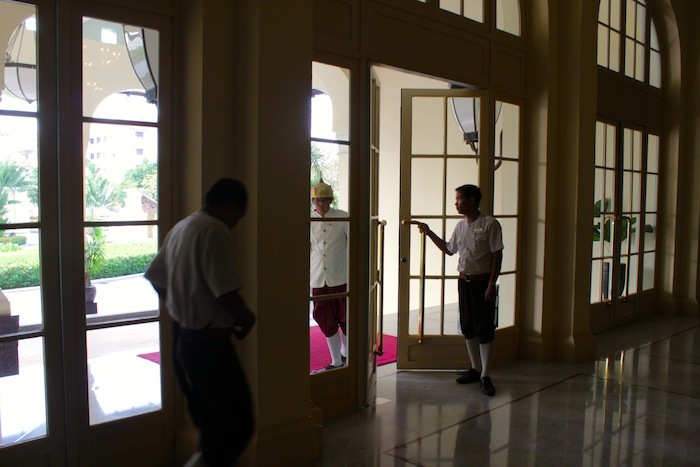 A short period of decline post-war led to a re-flowering of the hotel’s reputation during “Sihanouk time” in the ‘50s and ‘60s, when Phnom Penh flourished and tourists flocked. That golden era abruptly came to an end when the Khmer Rouge came into power and Phnom Penh was quite literally emptied of all its inhabitants for three whole years. 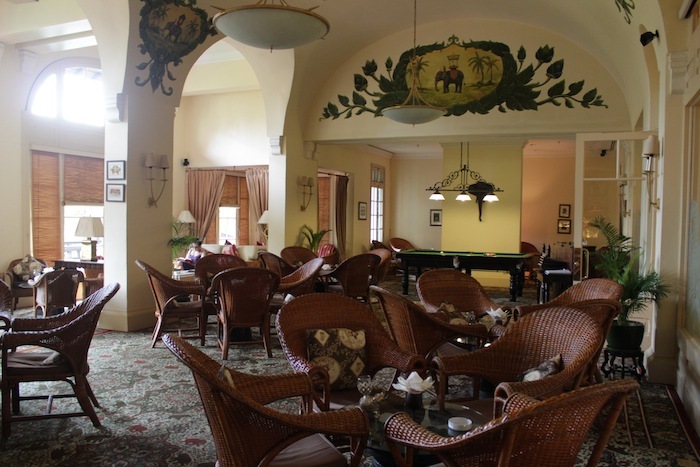 Le Royal served as a headquarters to Pol Pot’s military cadres, doubling up also as an underground food storage facility. While other grand colonial edifices in the city, particularly religious ones such as the city’s Cathedral – were ordered to be demolished completely, the hotel managed to escape unscathed. 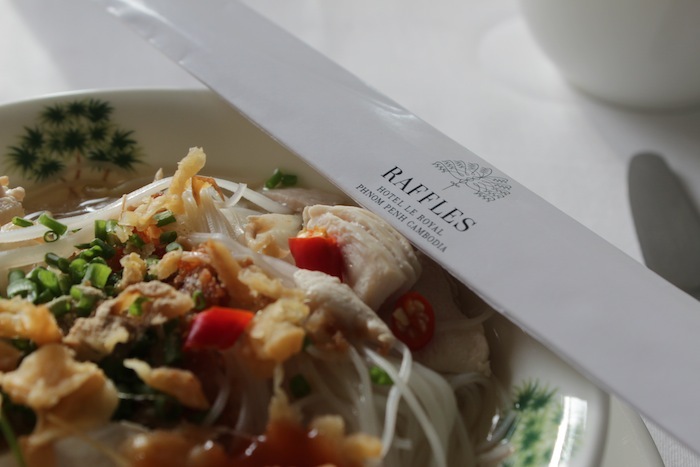 Today, the hotel is managed by the Raffles Hotel and Resorts Group, after an extensive restoration and renovation ending in 1997. It has regained much of its old world charm, albeit with modern trappings like an award-winning spa, upgraded business facilities and pool(s). I must admit that I was exceedingly won over by this hotel, largely because, being managed by the Raffles, there was a familiar Singaporean-ness – an immaculate neo-Victorian stiffness and spotlessness to the service and the amenities – that made me feel entirely at home; in fact, most at home in this, rather than any other hotel thus far on my Grand Tour (two thumbs up for Phnom Penh!). The minute I stepped into the hotel, I was made to feel utterly at ease by a bevy of concierge and service staff. After a short wait as my check-in was arranged for me, an impeccably liveried young man introduced himself to me as my “butler, Chanda” (not his real name) and whisked me off to my room. “Certainly,” he said chirpily when I told him I would like to carry my bagpack myself. “Certainly,” he said, amiably, in my room when he asked if I did not have any shirts to be pressed and I replied (rather uselessly) in the negative. “Certainly,” said he (still unperturbed) when he enquired if I did not want tea or coffee brought up to my room, and I replied again, sheepishly in the negative, because I was “heading out immediately for a photoshoot.” And then I did the most embarrassing thing: discreetly try to slip him a tip. He took a cursory, slightly questioning glance at me and very valiantly ignored my gesture. Instructing me, with the straightest face in the world, to contact him if I should need anything at all, he bowed graciously and slipped quietly out of the room. I was mortified. Granted, it was somewhat surprising that in this case, “Butler Service” actually meant a real, living butler at my beck and call. But then, what in the world does one do with a butler these days?! 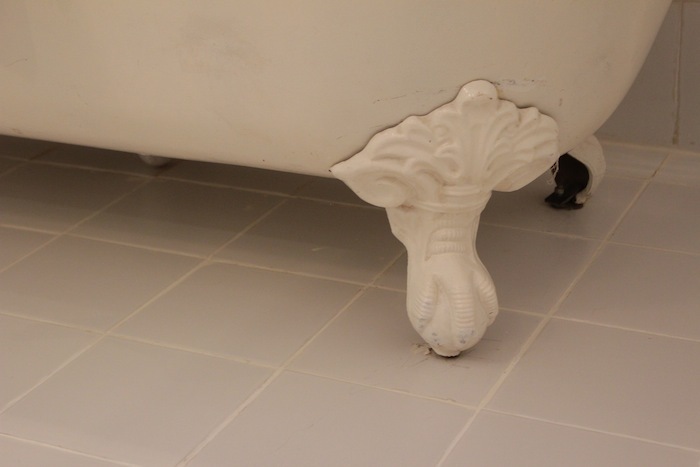 The clawfoot bath, in my bathroom. The room itself was a delight. I had opted for one of the hotel’s Landmark Rooms, situated in the original building (the hotel had a separate wing added to it in the late ‘90s), and fitted out in the colonial style, including period clawfoot baths. My room was at the far corner on the second floor, with a small but charming balcony facing out front towards the colonial heart of Phnom Penh. High ceilings, original light fittings from the ‘30s and yes – the clawfoot bath – made me feel deliciously out-of-place and out-of-time; and my room being in a very quiet part of the hotel, it seemed as though I had the entire place to myself that weekend, an illusion that was only broken when I had to head down to the pool or to breakfast in the mornings. The icing on the cake, however – and that which sealed, in my mind, this hotel’s place at the very top of my list – were the towels, all of which had been scented with rosemary, and when used after a cold shower, immensely invigorated one’s spirits with a subtle burst of fragrance, so that one shed off the dust and heat of the city, and was much prepared to descend for a drink. It was a very small detail, but one which made my stay all the more memorable. Royal white elephants, in the hotel lobby. Now, elephants are inextricably associated with royalty in Cambodia (as well as Thailand and Laos), betraying a deep-seated Siamese cultural influence as a result of almost a century of Siamese imperialism before the French showed up. In the days of royal pageantry at the turn of the 19th century, elephants were actually quite a common sight in the city. A whole contingent of them were reared in the Royal Palace Compounds, for the express purpose of carrying His Majesty the King, and the Royal Retinue whenever He (and they) emerged from the Palace. The King was never seen in public without his Royal Elephants and accompanying Large-Scale, slightly Over-The-Top Ceremonial Procession, which, I suppose, added significantly to his aura of Omnipotence and Divinity. World War II and transport technology (cars, motorbikes and the like) pretty much put the lid onto elephants as a means of Royal Transportation, and these days the only elephants to be seen in the city are hideous life-size plaster mock-ups in the Palace, and, not surprisingly, dozens of royal elephants strategically planted throughout the Hotel Le Royal, perhaps to further emphasise the establishment’s links to royalty. The Coat of Arms of the Hotel was an elephant and a tiger. 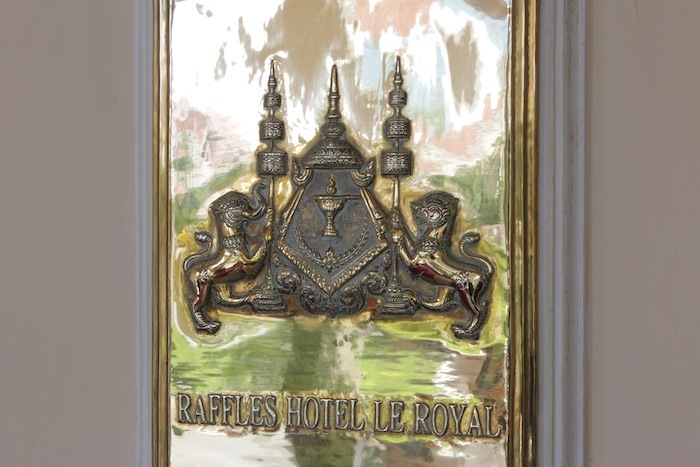 The hotel’s coat of arms, for example, depicted a royal elephant and a tiger bearing royal parasols. 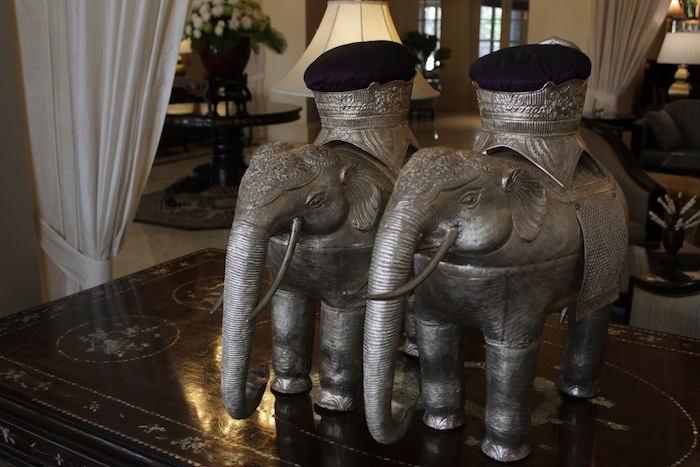 In the hotel lobby stood two pewter elephants decked out in ceremonial regalia, beside which many a visiting tourist invariably took a photograph. These were, as I understood, supposed to be white elephants, which were the most royal and most divine of all royal elephants, but also the most absolutely useless (they are the inspiration for the term “white elephant” in the English language after all), existing merely as symbol and not for any practical purpose whatsoever. Finally, the hotel’s signature bar, also the most famous bar in all Phnom Penh, was called the Elephant Bar. Said bar made no bones about decorating almost every inch of its interior with its namesake pachyderms. The beasts were painted on the walls, sewn into the carpets and cushions and doubled up as ornate tea lamp holders. When I ordered one of the house special cocktails, I even got a special three-headed elephant cocktail glass that was wrist-breakingly heavy but a good conversation starter. All in all, I was reminded keenly of a comic routine in the ‘60s Disney animated movie, The Jungle Book, where a “brigade” of elephants led by a bull elephant called Colonial Hathi would occasionally make their appearance marching across the screen only to always come to a sudden, tragically comic halt and ten elephant pile-up. The impossibly colonial Elephant Bar. My inadvertent thoughts about The Jungle Book were in large part due also to the ambience in the Elephant Bar (and in the hotel in general), which, overrun by Americans that weekend, channeled a Vietnam War era military officers’ mess and headquarters, complete with wicker chairs, men in uniform, and the woody scent of cigar smoke enveloping everything. In the late afternoons, the Bar and Hotel always seemed to be filled with a genre of do-gooding G.I. or diplomatic American types alongside small visiting groups of Americans on the Peace Corps or some other save-the-world group tour. As I sipped away at my glass of (exquisite) house red at the Elephant or Lobby Bars, I would overhear deep conversations about Cambodia, King Sihanouk’s passing, Minnesota, democracy and whatever else it was Americans talked about in serious tones when they got together. At the hotel pool also, I would see Americans with their pale skin and their Joseph Conrads and Somerset Maughams, intently and productively trying to better themselves while on vacation. I felt positively flippant in comparison. One of the Hotel’s two pools, in the courtyard. A lot of the reason for this pervasive American-ness, was that Le Royal was situated diagonally across the street from the American Embassy – a hulking, fortress-like structure that looked pretty much like every other American Embassy everywhere else in the world. That King Sihanouk had just passed away meant an intensification of diplomatic activity in and around the Embassy and, inevitably, the hotel. It was impossible, for example, to have dinner in the hotel without eavesdropping on some casual diplomatic conversation . Day One at Café Monivong (the hotel’s casual dining restaurant): I was seated by an American official from the UN, dining with the Singaporean Ambassador to Cambodia, the Cambodian Minister of Commerce, and another Asian diplomat. Throughout the evening they debated the relative merits of Sihanouk versus his son, the present King Sihamoni, and deliberated the future of the Cambodian monarchy (the present King is childless and in his 50s). Day Two at Café Monivong: I was seated beside yet another American diplomat dining with Australians, and discussing Southeast Asian politics. Across from me was an Australian delegation, having a business meeting with their Cambodian counterparts (including, intriguingly, a monk). In the meantime, a full-on formal dinner event was taking place in the Restaurant Le Royal (the Hotel’s European restaurant) next door, with dozens of military officials decked out in full ceremonial military regalia and their wives in evening gowns and pearls. It was all very exciting and old-school. Though admittedly, I did feel like my own reasons for being in Phnom Penh and in the hotel that weekend were somewhat trivial and inconsequential, compared to all this intensive diplomatising. Breakfast at Café Monivong Khmer noodles. Breakfast the next morning at Café Monivong involved a limited though delicious buffet spread. My choice was a rather opaquely named dish known as Khmer Noodles – chicken pieces and white rice noodles suspended in a light chicken broth and garnished with cut red chillis, chopped spring onions, preserved radishes and a sprinkle of lime juice. Sounds familiar? Maybe because it was. As I consumed my breakfast, I made two conclusions. Firstly, that there was really more in common in the foods across Southeast Asia than each individual nation cared to admit: my Khmer Noodles were almost indistinguishable from the soto ayam I had in Penang, or the chicken pho in Ho Chi Minh city, or the kwai tiew gai in Bangkok. Secondly, that I must be far more boring and predictable than I cared to admit, since at most of the breakfasts in each city, I happened to choose exactly the same type of chicken noodle soup! It was a sobering thought, either way. View towards the Amrita Spa, with the Hotel’s Coat of Arms emblazoned over it. After breakfast, I opted for a massage at the hotel’s excellently reviewed Amrita Spa. I was intrigued by the specialty “Khmer Massage,” though up till when I actually stood in the therapy room with my clothes off, and was firmly but smilingly told I could actually leave them on, I was unable to find out what exactly a “Khmer Massage” entailed. Turns out it was simply a massage without essential oils (therefore requiring no actual skin to skin contact). But what a massage! I had never been so violently pummeled, stretched and borderline asphyxiated. And I had never felt more energised after the violent pummeling, borderline asphyxiation and the extreme, almost acrobatic contortions my body was made to suffer. The entire experience – particularly the enigmatic smile on my masseur’s face as he proceeded to torture me in ways I could never imagine – was worth every penny. Another instance of the hotel’s coat of arms. That – that enigmatic smile – is probably my one takeaway from the city and the hotel that weekend. I call it the Angkor smile, because it first saw it on the faces of the numerous statues from Angkor that I had the chance to see in the National Museum. Intriguingly, I witnessed it on the faces of all the concierge and service staff in the hotel that weekend, who never failed to call me by name and to arrange for everything I could possibly need during my stay. I also saw it on the face of my butler, Chanda, whom I never once called upon during my stay but who still left a personal handwritten letter under my door asking if I had had a great stay. It was the smile of an ancient, ageless civilisation, and a gracious and patient people, who have lived through the worst of adversities, and today, face the likes of banal, frivolous, uncultured tourists like myself, who simply don’t understand (however one chooses to interpret these words). Vive Phnom Penh, et vive la khmerité! I really liked the city and its people and I think… no I’m sure that I’ll be back very soon. Joel Brinkley, 2011. Cambodia’s Curse: The Modern History of a Troubled Land. NY: Public Affairs. Andre Malraux, 1930. La voie royale (The Royal Way). Somerset Maugham, 1935. The Gentleman in the Parlour. NY Vintage Classics 2001 New Edition. Malraux had hatched a ridiculous scheme to loot and smuggle Angkor ruins into Europe for sale. He was caught and thrown in prison in Phnom Penh for a few months. At the other hotels, “butler service” was actually not much more than room or concierge services, whereas in this case there was an actual person “assigned” to me and making my stay comfortable. I learnt through eavesdropping that there was some kind of ceremonial laying in state at the Royal Palace happening that weekend and many diplomats from all over the region were in town. Gallery | This entry was posted in Art & Architecture, Cities & Regions, Landmarks & History, Literature & Philosophy, Photography, Travel & Mobility and tagged Amrita Spa, Andre Malraux, Cambodia, Hotel Le Royal, Landmark Room, Phnom Penh, Pierre Loti, Somerset Maugham, The Grand Tour, The Grand Tour of Southeast Asia. Bookmark the permalink.